Subscribe now by clicking the RSS or email buttons on the right to keep in touch with what we’re up to; what you should be doing in your garden at this time of year . 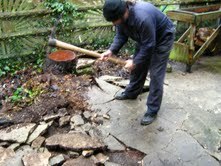 Removing tree stumps, old paving and concrete is hard work. Leave it to us and we’ll get the job done in no time. But this is only a small part of what we do. We mow, strim, scarify seed and feed lawns, clear sites, add borders, rockeries, features. We can help with ponds, lay hedges and plant new ones, preserve woodwork, in fact we can tackle any job in your garden. We will pollard trees at the correct time of year. We can erect fences and repair them. With a first class team and bringing in the right people and tools for the job, we are efficient and cost effective. Best of all you get a family run firm of friendly people who listen to what you want and really care for your needs. We undertake private or contract work.